As I was playing Call of Duty: Ghosts, Activision’s newest entry in the long-running franchise, I came across a journal written by Ghost Logan, star of the game. These are his words. War never changes, does it? The world ended today. I don’t exactly know why, but it did. We didn’t do nothin’ to deserve it, I don’t think. We was sitting in the woods for no apparent reason one day while our dad was telling us about the Ghosts, an elite group of killers who are totally badass and basically superheroes. But I didn’t believe him. Ghosts ain’t real, after all. We was walking back home when the ground shook something fierce. “Probably just one of them west coast tremors,” we thought. But we were wrong. Fire rained from the sky, holes opened up in the ground. Society collapsed all around us and I knew from then on nothing would be the same. Nothing. It’s been ten years. I haven’t written in that length of time because I thought it would be dramatic to see the difference between the world then and the world now, but really, looking back, I guess it’s just a narrative contrivance for narrative contrivances sake. Plus now I have a dog so the world is way cooler. Also, I’ve gone mute. I guess the shockwaves from the giant warheads that rained down all those years ago ruptured my vocal cords. At least my bro is here to speak for me. Our enemy is incredibly stupid, poking heads out of cover constantly, making this feel more like Mad Dog McCree complete with canned animations, Wilhelm Screams and cheesy arterial spray than an actual war. My teammates are no less incompetent, always moving right in my line of sight. I hear screams of “check your fire!” every two to five minutes. I’m sorry random military personnel! I didn’t mean to shoot you. Maybe next time you’ll learn to not get in my way while I’m firing a gun. I don’t know when we’re getting out. But I hope it’s soon. We bombarded the bad guy’s base killing hundreds of soldiers. How we got out alive without a scratch I’ll never know. But as we burst through the doors where our enemy, the one who threatened our very way of life, was standing, I took the liberty of shooting him because my crosshairs turned red and I figured, “hey he’s an enemy and we’re trying to stop the enemy so why not just shoot him and get it over with so I can get back to my doggy?” But no. I fired my weapon and everything went dark. Soon I was climbing the stairs to that same doorway we burst through once before… or did we? Maybe I’m going crazy. My eyes grow weary. I continue to run down corridors as they explode around me from gunfire and grenades. The bland, colorless locals whizz by and I lose track of the dumb places I’ve been and how much stuff blows up around me. At this point I know full well what will happen on every one of my missions: I’ll run down corridors, shoot a bunch of bad guys, do something that seems kind of cool but really isn’t, then I’ll continue running as a whole bunch of stuff blows up all around me. I’ve gotten bored of explosions and toppling buildings — I never thought I’d say that but, yeah, I think I’m over it. Mostly I miss my dog. I’ve only seen him a few times in this campaign and I relish the chance to once again command him to rip out the throats of my enemies. He’s such a good dog. I hope he leads a long and fruitful life and meets a girl dog and they make dog babies. Then I could have an entire army of doggies that I command to rip the throats out of my enemies! I will keep this plan a secret for now. It could be the key to winning the war. Our war campaign feels like a joke, like someone is making fun of bombast and idiotic plot lines in those war video games and forcing me to fight through them. Everything I’m doing is ridiculous, crazy, impossible, scattershot, and boring most of the time. But our final assault against the bad guys was actually a fun experience, like the only thing that I reacted well to in this entire war. I was constantly shifting back and forth through all the various outlets of destruction as part of our last ditch effort to save the world. I rolled a tank through enemy bases destroying everything in my path, went to space where I fought guys in zero gravity, then to a pretty awesome looking train battle. It was fun and stupid in a kind of compelling way. The final battle has been fought and as I look back on my experience I wonder where it all went wrong. Probably around the time I almost fell asleep fighting off waves of bad guys as something blew up. If I can’t get enjoyment out of the basic functions of war, what is it good for? Absolutely nothing, Edwin Starr would say. Anyway, I’ve got orders to head up to central command for some big new mission. I’ll try to write again soon. The higher ups said I needed to refine my soldier skills so they’re letting me try out their fancy new military training simulators designed to pit humans against each other in virtual environments, fighting for points and the title of Ultimate Soldier Master. What they’ve created is kind of like back when I played those modern military video games before I became a superhero Ghost soldier. Unlike Black Ops II (the last of these military shooters before the world ended) where maps felt incredibly simplistic with their top, mid, and bottom rows and various interweaving paths, the Ghosts maps seem a bit more haphazardously designed — which is a bit of a double-edged sword. While these maps still follow that tried-and-true formula, they also work well at letting players maneuver with more agency. However, some of these maps also feel too big; there are sometimes too many paths to choose from and I found myself constantly hunting for enemies to no avail. 12 players is hardly sizable enough for some of the larger scale maps. They put me through more multiplayer matches today and I’ve found that multiplayer is the same multiplayer I used to play, only not really as good. New features this year include an all new way to customize your character because why not mix it up like they do every year. Instead of leveling up just one character, I was given a squad of ten soldiers I could choose from to customize and outfit to my heart’s extent. Each squaddie has their own separate level, so if I change my player character I’m not earning XP for any of the others. It is an overly complicated way to introduce more customization for your avatars, and is absolutely superfluous to your experience. Also gone is Black Ops II’s Pick 10 system for outfitting weapons and perks, now they give me Squad Points! I gain these Squad Points by completing challenges and leveling up. Anything can be unlocked if I have enough Squad Points, making it a simple task of outfitting my soldiers with exactly what I want in the early levels. Now gone are the days where that level up sound means anything, since my level determines absolutely nothing but the number by my name. Killstreaks return with more emphasis placed on ground rewards. UAVs no longer circle the skies, instead they are strategically placed in the level by the player who got them. Some of the other new killstreaks allow me to take on the form of a bigger, better soldier that doesn’t go down easy. They’ve taken away the supremely overpowered helicopters and planes from before, but killstreaks are still an off-balance way for the good players to get better, and the bad ones to do worse. But hey, there’s a killstreak reward that gives me a doggy to fight with! So there’s that. Cranked is the only new multiplayer mode that is actually (stupidly) enjoyable. For every kill I got I was then “cranked” and had 30 seconds to kill again or else I would die. I was so hopped up on kill-juice that I ran and aimed faster, among other abilities that stacked on each kill. The ethics of the whole thing are fishy since my avatar is basically addicted to killing, but it makes for a pretty enjoyable multiplayer mode. I was put to work in a new Squads mode, allowing me to play against AI controlled bots rather than real players. These matches take the soldiers I created in multiplayer and creates teams to fight with me, cooperatively with a buddy, or competitively where my squad can fight another guy’s squad. It’s incredibly similar to the Combat Training mode from the first Black Ops, only with more menus. I don’t know about the other soldiers, but if I’m fighting a war, I don’t want to fight computers — I want to fight real guys! Thereby making this mode kind of needless and only useful for earning Squad Points, but I’ve already got enough of those for what I need. The higher ups designated me to be their test subject for a new multiplayer mode called Extinction. It has many similarities to Zombies mode from Black Ops II, but trade out the zombies for aliens and boarding up windows to moving a big drill through the map to destroy hives. It boils down to running from point A to point B, placing the drill near the hive and protecting the drill until the hive is destroyed. Each kill nets money that I spent on weapons, environmental hazards, and power-ups like weapon crates, gun turrets, or bouncing betty mines. The alien designs aren’t all that special and they glow when they get angry because video games. I told the higher ups I didn’t want to play this mode any longer than I had to because a constant protect-the-point, horde mode doesn’t appeal to me in the slightest. The war is far from over. I don’t know how long I’ll last out there. But with my doggy by my side, anything is possible. We’ll win this war. We’ll stop the bad guys. I just wish the world wasn’t so grimy and void of any color. But I guess that’s what you get with an apocalypse. My doggy is barking at something in the distance. I fear this will be my last entry for some time now. If anyone is reading this, don’t fight wars anymore. They never change. Ghost Logan seems to have echoed all of the key points I wanted to hit on in the game he stars in. It’s dumb and boring. The multiplayer is a step down from past iterations just based on the convoluted way it handles leveling. I never enjoyed Treyarch’s Zombies mode and Extinction is basically a dumbed down, less crazy version of that. 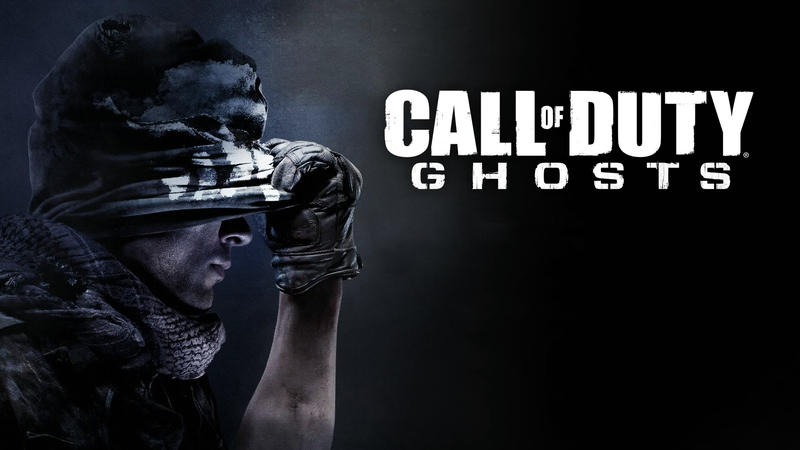 Ghosts is the shell of what made past Call of Duty games fun. 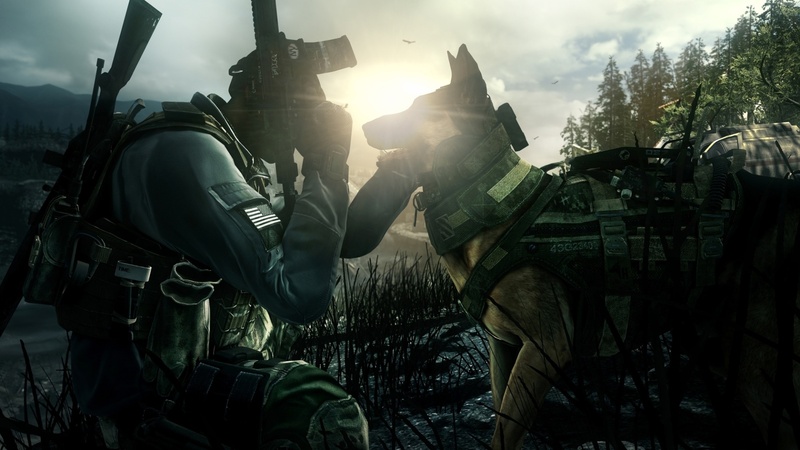 Like the developers of the Guitar Hero games, or the Tony Hawk games before that, Infinity Ward’s heart doesn’t seem into Call of Duty any more. 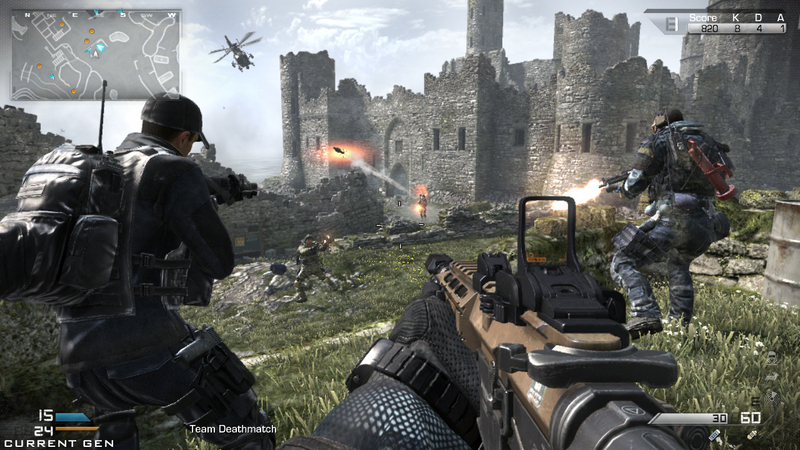 Note: Call of Duty: Ghosts was reviewed using a retail Xbox 360 copy provided by Activision. This in no way impacts the content or score of the review. I really enjoyed this review Clint, Very well done lol. Quite comedic also! Thanks I am a bit strapped for cash at the moment and will definitely put this on the hold pile instead of the need right now pile. I actually disagree. Extinction adds in a new element. More types of enemies and a actual feel for survival instead of “oh I’m just gonna walk these zombies in a circle and shoot them 6 times each in the face to kill them.” No. Just no. The multiplayer is more real time instead of run and gun bullet tag. In order to survive better you actually need to take cover, use your slide, and lean the corners. This campaign actually had me wondering where things were gonna go and had a nice twisty ending. Unlike black ops 2 where I could stop any time because I felt like a was 1 super soldier taking 100 bullets and still shooting like a spastic donkey with an itchy trigger finger. The maps for multiplayer are fun and add a nice variety of range and close quarters so you have to prepare. Overall I really enjoy this game. The things I don’t like is the unlock system seems almost unfair having to unlock items individually for each squad member but then again it was stated that each squad member is like prestiges. 10 members each able to hit 60. So If you max out one and move on to another it’s just like prestiging. You have to buy things again. So it wasn’t without reason. Also the guns don’t seem to be balanced et so some are overpowered. However this can be fixed in a later patch as it is just recently released.